No, it’s not a blanket for your car, it’s a blanket specially designed to roll up and keep in your car. Up here that’s just part of the winter survival kit, along with the required Oreos, but we won’t get into that here! 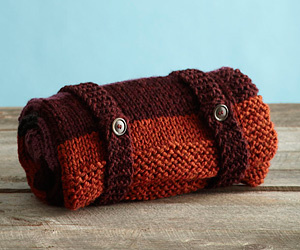 And click here to get the pattern, free, from Lion Brand Yarn!